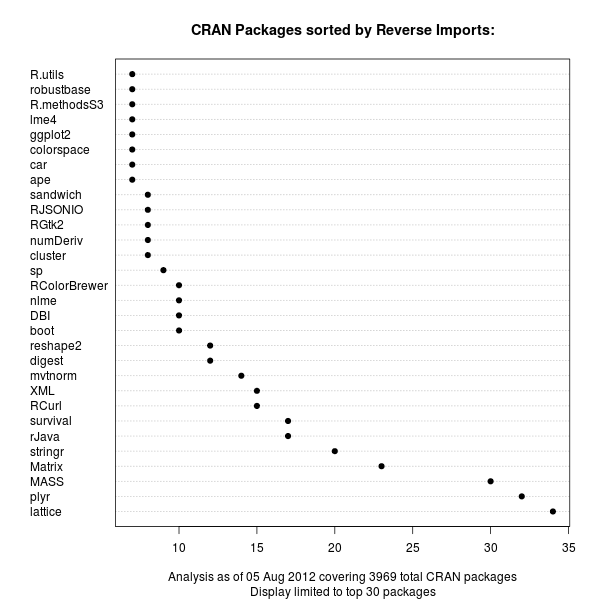 The recent update by Søren Højsgaard's to his gRbase package for graphical models made it the 75th package to depend on our Rcpp package for R and C++ integration. So in a lighthearted weekend moment, I tweeted about gRbase being number 75 for Rcpp to which Hadley replied, asking if Rcpp was in fact number one among R package Depends. Far from it, and I immediately replied listing lattice and Matrix as packages with way more other packages depending upon them. But as the question seemed deserving of a bit more analysis, I spent a few minutes on this and prepared three charts listing package in order of reverse Depends, reverse Imports and reverse LinkingTo. First off, the reverse Depends:. This is the standard means of declaring a dependence of one package upon another. Unsurprisingly, the MASS package from the classic Venables and Ripley book comes first, with Deepayan Sarkar's powerful lattice package (also covered in a book) coming second. These are both recommended packages which are commonly distributed with R itself. Next are mvtnorm and survival. Our Rcpp is up there in the top-ten, but not a frontrunner. Now lattice still leads, but Hadleys's plyr package grabbed the second spot just before MASS and Matrix. It is interesting to see that the sheer number of Imports: is still not where the Depends: are. 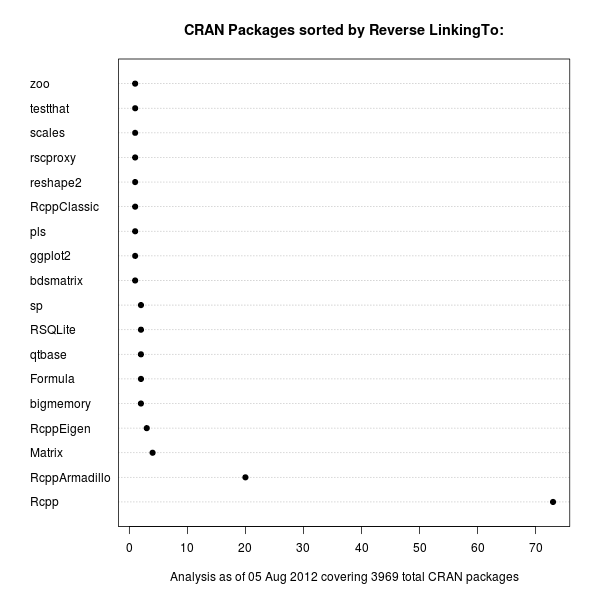 On the other hand, we see a number of more recent packages popping up in the second chart. This may reflect more recent coding practices. It will be interesting to see how this stacks up over time when we revisit this chart. Lastly, we can also look at LinkingTo:, a declaration used to provide a C/C++-level dependency at the source code level. We use this in the Rcpp family to provide automatic resolution of the header files needed to compile against our packages. And unsurprisingly, because packages using Rcpp actually use its API (rather than R functions), the package is a little ahead of others. 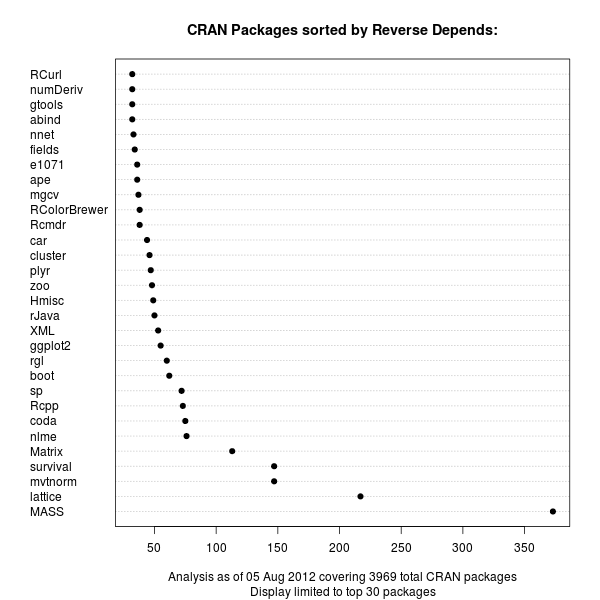 In the package we find three more packages of the Rcpp family, but only a limited number of other packages as C/C++-level dependencies are still somewhat rare in the R universe. There are also fewer packages overall making use of this mechanism. One could of course take this one level further and sum up dependencies in a recursive manner, or visualize the relationship differently. But these dotchart graphs provide a first visual description of the magnitude of Depends, Imports and LinkingTo among CRAN packages for R.